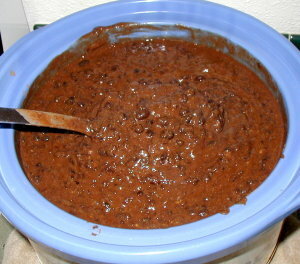 A great way to make a double batch of this is to cook 5 cups of dry black beans in the crockpot overnight. Use a 4- to 5-quart crockpot. In the morning, you'll have 15 cups of cooked black beans, which will make the following recipe twice. Use half the beans for the first batch and then put it back into the (washed) crockpot. Then use the other half of the beans to make it again, and add that to the crockpot also. Keep the crockpot on low and the beans will be ready for eating immediately or in a few hours — whenever you're ready! They'll thicken as they cook, so adjust liquid as you desire. These beans are delicious many ways. One of our favorites is to use them in rice bowls. Scoop the beans over prepared brown rice and top it all with foods such as seasoned shredded chicken, diced onions, sliced olives, diced avocado, shredded goat cheddar cheese, cilantro, bean sprouts, etc. Combine all ingredients in a deep skillet over medium heat, starting with 1 cup of water and adding more as needed. Mash with potato masher so that the beans are chunky in a thick liquid. (Or to the consistency you desire.) When thoroughly heated, transfer to crockpot set to LOW to stay warm until ready to serve. I wish we were able to copy and paste your receipes. I do not have a computer in the kitchen and it is really hard to run back and forth or copy it off by hand. Kelli – Are you able to print? If you can – just use the File menu and Print and the recipe will automatically be formatted for the printer – sans comments, sidebars, header, footer, etc. I would like to understand the benefits of adding nutritional yeast to recipes, including this recipe. I believe I remember reading something about it in NT but would like to hear it in your words. Do you sprout these first? Thanks! !